"This process is re-victimizing the victims," one person said. 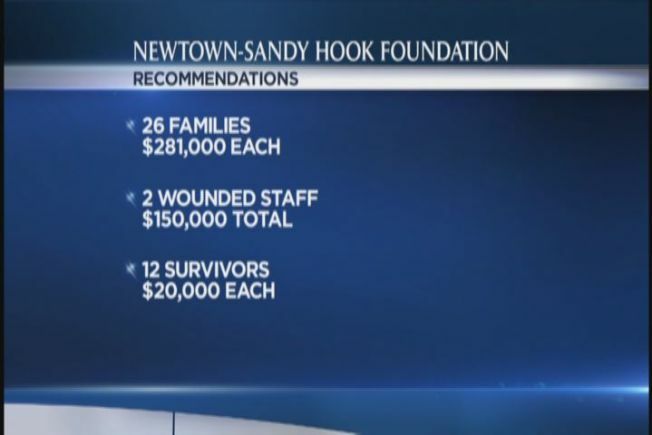 Frustrations and confusion were aired Thursday evening at a public forum on how to distribute the millions of dollars in donations collected after the massacre at Sandy Hook Elementary School, just as the community learned of the plans for the breakdown of the funds. With its first chance to weigh in on how to divvy up the $7.7 million set aside for families most affected by the tragedy, the community said the process had been agonizing and not nearly transparent enough. "This process is re-victimizing the victims," said Caryn Kaufman, to applause from other community members at the meeting at Edmond Town Hall in Newtown, Conn. Many people in attendance wished the fund had been dealt "in a much more transparent way," said Rob Accomando, the founder of the My Sandy Hook Family Fund, which he said has already given $1.6 million to families. David Lewis, whose grandson Jesse was killed at the school, stressed the need to ensure that the donated funds go to what donors thought they would go to. "Because if it doesn't go to right place this time, people may not give next time," he said. Accomando also wondered what would happen to funds raised in the future, while Kaufman wondered whether any donations had been received since March. Scarlett Lewis, the mother of young Sandy Hook victim Jesse, mouthed "thank you" to Accomando after he spoke. Earlier in the evening, a draft plan put forward proposed giving the 26 victims' families $281,000 each, while giving a total of $150,000 to the two wounded teachers and $20,000 to each of the families of the 12 students who escaped. "Is the money adequate? No, it's not adequate. It's never adequate," said distribution committee advisor Ken Feinberg. His consulting company also helped oversee victims' funds for the Sept. 11, 2001, terrorist attacks, the Boston Marathon bombing and the Aurora., Colo., theater shooting. More than $11.4 million has been raised for the fund, 70 percent of which is going to the families most affected. The other 30 percent has been set aside for community purposes, and a separate foundation will decide how to use it. Several victims' families said they would not comment until the final draft of the plan is released Monday.